Keto Chilli Con Carne - "Spicy & Hearty" Ground Beef Recipe - NO Beans! 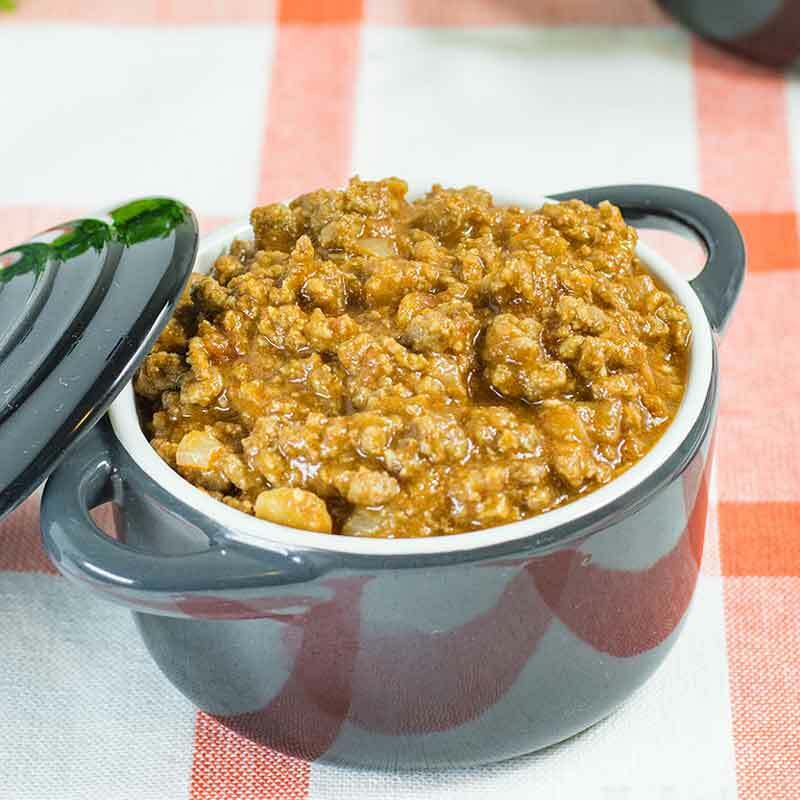 Home » Recipes » Keto Chilli Con Carne – “Spicy & Hearty” Ground Beef Recipe – NO Beans! This Keto Chili Con Carne recipe is spicy and meaty with NO Beans to keep it low carb. This recipe yields approximately 1.3kg/2.8lb of keto chili con carne. We have made a serving size 3/4 cup which is equal to approximately 150g/5oz of Spicy Beef Chili. Enjoy topped with sour cream, cheddar cheese, and our Guacamole. Serve the chili over Cauliflower Rice and top with sour cream and cheese. Use as a base for Hot Baked Eggs. 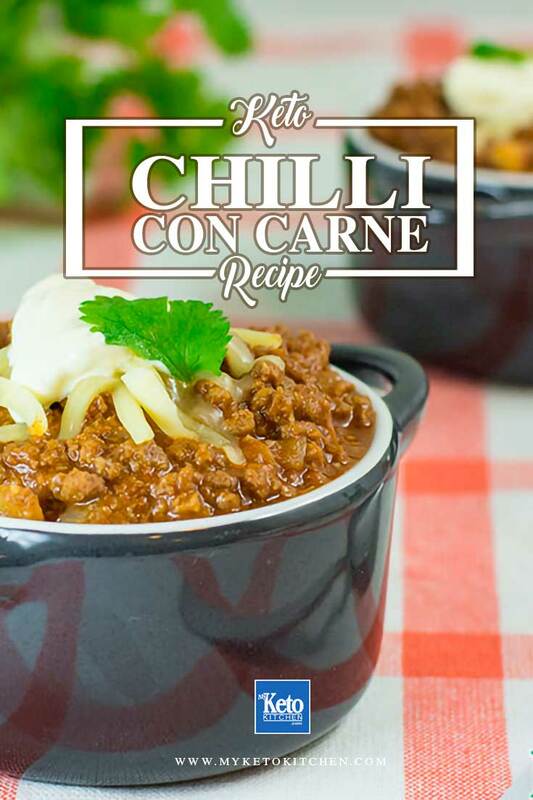 This Keto Chilli Con Carne recipe makes approximately 7 serves. If you like your Keto chilli can be made hotter with your favorite hot ingredients so feel free to experiment. Alternatively, if you like your Chilli milder you leave the chilli our all together if you wish. Add the oil, onion, garlic, and chopped chilies and saute for 3-5 minutes until the onion is translucent. Add the chili powder and salt and stir well. Add the ground beef. Stir continuously to break apart the meat, saute for 10 minutes until the beef is well browned. Add the tomato paste, paprika, cumin and coriander and stir well. Cook for 5 minutes before adding the canned diced tomatoes and pepper. Mix well. Serve immediately, or cool and store in the fridge for 1 week, or in the freezer for up to 3 months. 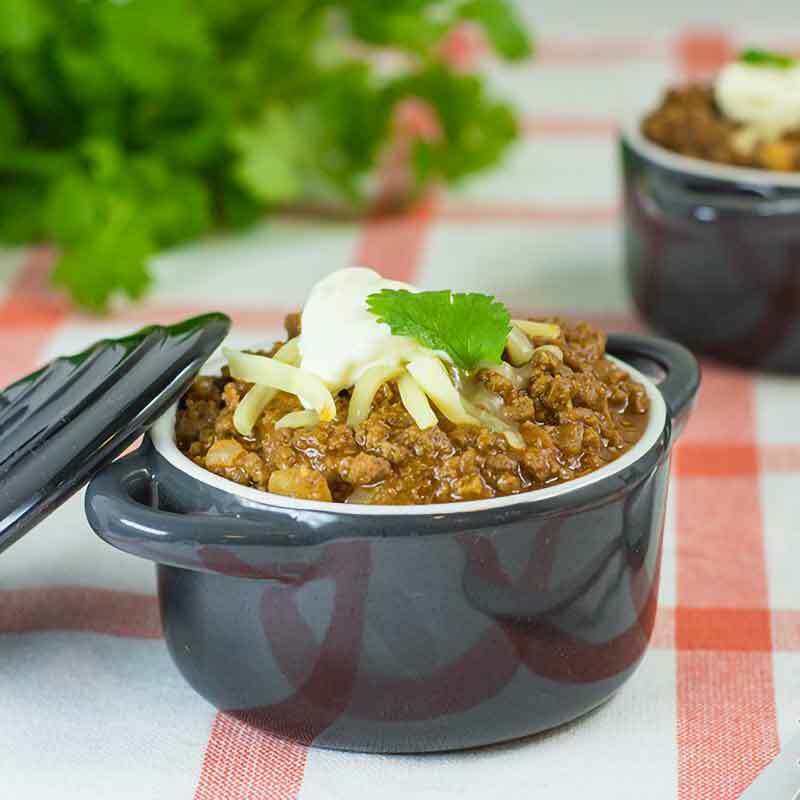 This Keto Chilli Con Carne is Low Carb Spicy & Meaty. With NO Beans! Very Easy to make and you can cook it in bulk for later! Add the oil, onion, garlic and chopped chili’s and saute for 3-5 minutes until the onion is translucent. Is Chilli Con Carne Low-Carb and Keto Friendly? The traditional way of making Chili Con Carne is not low carb or Keto friendly. Normally Chili Con Carne contains kidney beans, rice, and sugar. None of those ingredients are low carb but as you can see in our recipe above we make ours a little differently so that it is perfect for your Keto diet. Keto Chili Con Carne Recipe with NO Beans! To make a larger batch of this Keto Chili Con Carne recipe adjust the servings above. I just made it today and I love it! 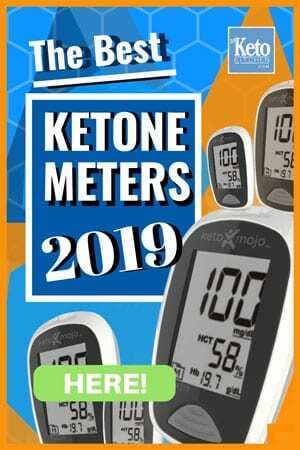 I am considering following the keto diet and just want to try some recipes to see if its for me. This is good chili! Made this tonight for dinner. We had it with zucchini ribbons, Absolutely delicious!! !